After many years in the collectables wilderness, Marvel’s criminal foursome, The Wrecking Crew, has finally received some much welcome attention in the last year or so. 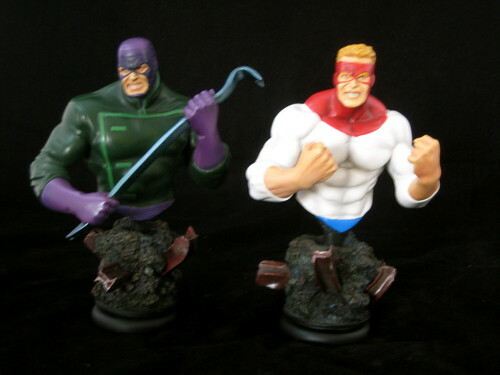 They were made into 3 ¾” figures by Hasbro in the Secret Wars / Marvel Universe line, and now they’ve become available in mini-bust form thanks to a four-pack of busts from Bowen Designs. I got to know this motley crew in the original Secret Wars back in the day and then looked up many of their earlier appearances, so when I first saw this set solicited I knew I’d be ordering it. Bowen has been exploring larger sets of busts in recent times, with the web-exclusive Guardians of the Galaxy set (something I’m yet to own) and more recently the very fun Warriors Three set. It’s a clever way of packaging together characters that may not sell so well individually for fans who will want the complete set anyway. perfect character to place at the front of the Wrecking Crew display. I can only imagine the challenges involved in designing statues with moving parts or attachments, like Thunderball’s…. thunderball. The ball is quite lightweight to keep it from overbalancing the bust, but it definitely looks the part. This is complimented by a great sculpt and an excellent paint job that really captures the character. I also like the threatening pose. Thunderball and Wrecker make great bookends! His face is also the best done of all of the pieces since he doesn’t have visible eyes – the eyes on the other pieces are all just the tiniest bit off to me. I’m pleased that the look chosen for Bulldozer is more classic than modern age. He hasn’t always been quite as gigantic as he is now, and his headgear in the comics just keeps getting bigger and crazier. This bust is the look I much prefer for him, with a nice use of metal paint for his helmet. He has a suitably crazed look and aggressive pose. I like the way that his helmet covers his nose – it makes his scowl look part scary and part dumb. Piledriver is the only bust in this set that I have any real concerns with. It’s something in the face – perhaps the darker tone used to paint his lips – that causes the eye to be drawn to it above the rest of the piece, and it just doesn’t quite fit. It’s also the least dynamic pose, although I think it’s been chosen to highlight Piledriver’s main weapons – his fists. Certainly not a miss, but without a doubt my least favourite of the set. Each character sits on a matching base with rock and twisted girders. Considering that these were made to be a set, it might have been an idea to set these at different heights for display, but that’s not the case here, so it’s up to the creativity of the collector to find ways to set them out. 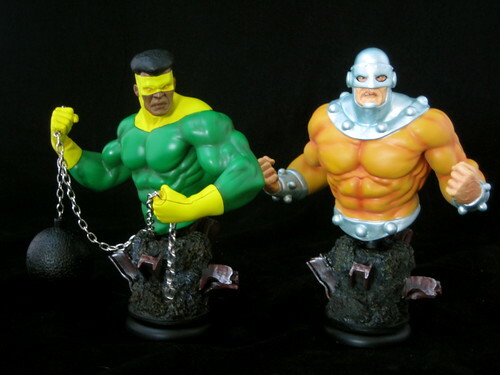 This set is a great example of one of the reasons I love Randy Bowen’s product: he knows and understands the Marvel Universe as much as we do. 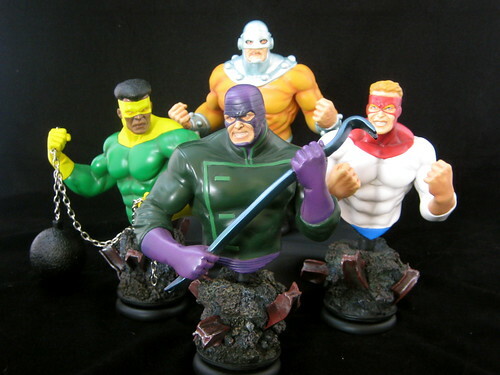 I’m hopeful that Bowen’s efforts with sets of busts will continue, as there are a number of groups / teams of Marvel characters I’d love to see in this form: The Squadron Supreme, Masters of Evil and U-Foes are some examples that come to mind. You can see more pics of these and other Bowen Busts at Facebook, discuss this at the AFB Forum, and comment on this post to enter the March AFB Comment of the Month Contest! This was the set that almost pushed me over the edge to collecting Bowen busts. May favourite 4-some of villains and Bowen has done them justice. Great review too Andy. I want them. I will. Just got to be patient. Thanks for sharing. Would have been nice if you mentioned in the article that the pieces were sculpted by Keith Kopinski, for Bowen Designs.